Jessica joined GreenBlue in May 2017 as a Project Associate for the Sustainable Packaging Coalition’s How2Recycle program. 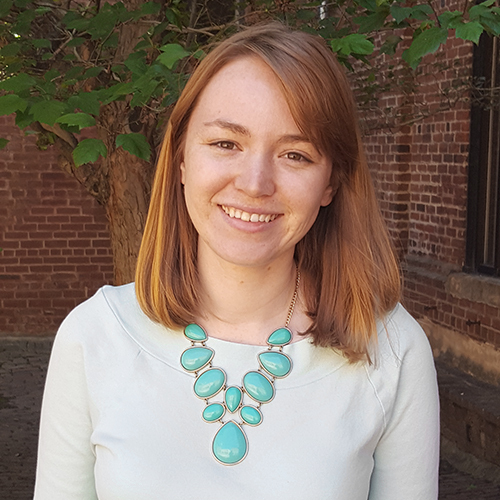 Previously, Jessica worked as a consultant for Green Strategies in Washington, DC where she assisted corporate clients with developing strategies to engage consumers, business partners, and other stakeholders in improving the environmental impact of their products and services. She also has experience in environmental education and sustainable agriculture, and worked on a residential solar campaign in the Hudson Valley. Jessica’s dual passions are writing and the environment, and she received her B.A. in English with a minor in Environmental Science and Policy from the College of William & Mary. While in school, Jessica spent time studying in Iceland, where she lived in a small eco-village while learning about the country’s rich environmental and cultural landscape. Originally from Virginia’s Middle Peninsula, Jessica divides her free time between browsing used book stores, knitting voraciously, and exploring the abundance of trails and natural areas Charlottesville has to offer.